"Do take photos, but be sure to enjoy the view." Full screen that is. Hahah! 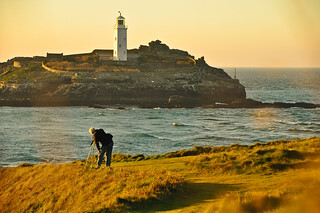 This was taken near the coast by St. Ives, during the fabled 'golden hour', when all lighting is naturally perfect. And the sunlight at the time, setting and in combination with the particles in the air had created very good conditions. The blob and streak you see on either side of the photo is because I took this from behind a raised clump of grass (Mendhak patented stalking technique #14) - I didn't want that guy to turn around and see me. He was there in the same position for about 5 minutes. I think this guy may have had the same approach to photography as me - take 20 photos of the same thing, then go home and delete 19.